Three 4-Hour Career Planning & Exploration sessions for High School Students and Parents - Please Click Group Workshop link for more information. 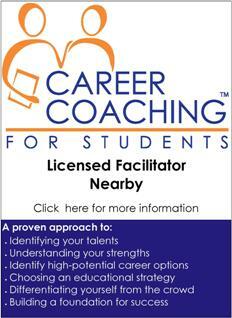 Career Coaching for Students� self-directed program is available for home use. Includes step-by-step student guide book, talent assessments, one phone debriefing and full access to our student resources on the web. Click the image to your right for more information including how to order this program.